1. 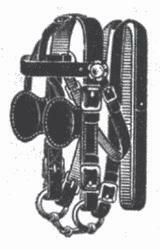 A harness, consisting of a headstall, bit, and reins, fitted about a horse's head and used to restrain or guide the animal. 2. A curb or check: put a bridle on spending. 3. Nautical A span of chain, wire, or rope that can be secured at both ends to an object and slung from its center point. 1. To put a bridle on. 2. To control or restrain: could not bridle his excitement at the news. See Synonyms at restrain. 1. To lift the head and draw in the chin in anger or resentment. 2. To be angry or resentful; take offense: bridling at the criticism. 7. (tr) to restrain; curb: he bridled his rage. 1. part of the tack or harness of a horse, consisting usu. of a headstall, bit, and reins. 3. a link, flange, or other attachment for limiting the movement of any part of a machine. 4. a rope or chain secured at both ends to an object, and itself held or lifted by a rope or chain secured at its center. 5. to put a bridle on. 6. to control or hold back; restrain; curb. 7. to draw up the head and draw in the chin, as in disdain or resentment. The headgear with which a horse is guided. It includes a Bit, which goes in the horse’s mouth, and various straps that go around the horse’s head and hold the bit in place. Horses become quite adroit at spitting out bridle bits so a well-designed bridle is a necessity. Unlike the rest of the harness, which was quite late in development, bridles looking remarkably like those still used on horses first appeared in ninth century b.c. Mesopotamia relief carvings. Verb 1. bridle - anger or take offense; "She bridled at his suggestion to elope"
2. bridle - put a bridle on; "bridle horses"
snaffle - fit or restrain with a snaffle; "snaffle a horse"
1. rein, curb, control, check, restraint, trammels She dismounted and took her horse's bridle. 1. get angry, draw (yourself) up, bristle, seethe, see red, be infuriated, rear up, be indignant, be maddened, go crook (Austral. & N.Z. slang), raise your hackles, get your dander up (slang), get your back up He bridled at the shortness of her tone. 2. curb, control, master, govern, moderate, restrain, rein, subdue, repress, constrain, keep in check, check, keep a tight rein on, keep on a string I must learn to bridle my tongue. bit, brake, leash, restraint, snaffle. bit, brake, check, constrain, curb, hold, hold back, hold down, hold in, inhibit, keep, keep back, pull in, rein (back, in, or up), restrain. He drops his bridle on the pommel of his saddle, whistles to his pony, and disappears in the mist; riding with his hands in his pockets, and his pipe in his mouth, as composedly as if he were sitting by his own fireside at home. An hostler stood near, holding by the bridle another immense horse--apparently a near relative of the animal in the chaise--ready saddled for Mr. The minute he was on, the horse begun to rip and tear and jump and cavort around, with two circus men hanging on to his bridle trying to hold him, and the drunk man hanging on to his neck, and his heels flying in the air every jump, and the whole crowd of people standing up shouting and laughing till tears rolled down. Nay," laughed Robin, seizing the Sheriff's bridle, "I have been at too much pains to cultivate your company to forego it now so easily. He then descended the little staircase, went out at a lateral door, and perceived at the end of the wall a mounted horseman holding another horse by the bridle. What means the knave by clinging to the bridle of my steed? As soon as the horse touched the bottom on the other side, the man pulled himself on, and was firmly seated, bridle in hand, before the horse gained the bank. Therefore there is no better way, to moderate suspicions, than to account upon such suspicions as true, and yet to bridle them as false.